Looking to update your red brick to a lighter, more modern style? Whether you need a fresh look for your fireplace or your home's exterior, whitewashing brick will create a softer look while maintaining the brick's natural texture and variety. There are two methods you can use for this process. Typical whitewash is created by mixing an even amount of white latex paint and water and then applying a thin layer to clean red brick. Or, for a more rustic look, applying a German smear to brick is done by spreading a mortar and water mixture onto the bricks and then removing a portion before it begins to set. Regardless of the location, you must thoroughly clean the surface before you can whitewash brick. Harsh cleaning supplies can damage brick, so start with soap and water. Gradually use more aggressive cleaning solutions until the job is complete. Rinse the brick thoroughly to remove any excess cleaning solution and then let it dry completely. If your brick was previously painted, make sure to remove all remaining chips of paint and repair any damage. Whitewashing over old paint will cause crackling. A word of caution: If the paint on your brick is several decades old, it may be toxic lead paint. In that case, call a professional to have it removed properly. Before you begin to paint interior brick, protect the surrounding area with painter's tape and kraft paper. If you plan to whitewash a fireplace, make sure to protect the firebox or fireplace insert. Don't forget to cover the flooring with drop cloths – whitewashing can get messy! Begin by mixing an even amount of white latex paint and water. Once combined, stir well to create an even consistency. Test your whitewash in a small and inconspicuous area to determine your ideal tint. If you prefer the brick to look more white, add more paint. For a lighter look, add more water. But be careful not to thin the paint too much as the final result will appear lighter once the paint dries. Fill a spray bottle with water and lightly spray an area of brick – be careful not to leave drips. Alternatively, you can wipe an area with a damp sponge. If you're whitewashing brick outdoors, you can use a hose. Place a wadded cotton cloth into your whitewash mixture and spread it onto the damp bricks. If the mortar is deeply recessed, put a small amount of the paint mixture on a sash brush and, using the dry brush technique, apply the mixture to the mortar as well as the edges and ends of the bricks. Repeat this process an area at a time, making sure to apply your whitewash before the bricks dry. Use a dry brush to fill in any hard-to-reach areas, then let the paint dry overnight. Prepare the brick and surrounding areas in the same manner you would if whitewashing the brick. Instead of mixing paint and water, though, the German smear is created with a ratio of 70 percent mortar and 30 percent water. It will have a thick, creamy consistency. As with whitewash, adding more mortar will create a more textured look, while adding more water will create a more translucent look. Before applying the mixture, make sure you put on heavy rubber gloves, protective goggles and old clothing. Then, wet the surface and apply the mixture with either a grout sponge or trowel. Finally, before the mixture is dry, use the trowel or a wire brush to remove some of the mixture from the brick. If you prefer the brick to slightly peek through, only remove a small amount. 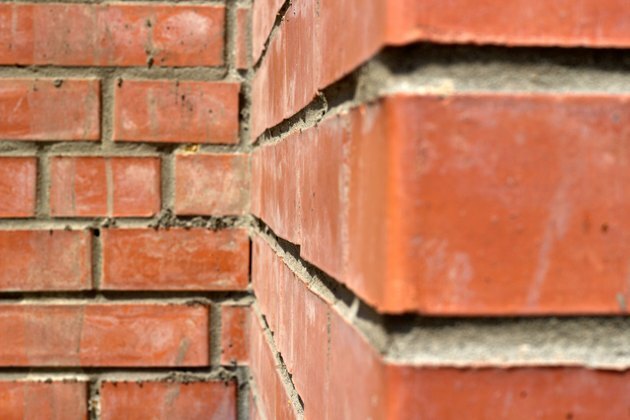 To create the look of irregular-sized bricks and wide mortar joints, remove a large amount of mortar. Gia Miller received her journalism degree from The University of Georgia and began her career as an intern at O, The Oprah Magazine. She then spent several years at Elle DECOR magazine where she immersed herself in the world of interior design. Several apartments and homes later, she’s now mastered the art of DIY. Gia enjoys writing stories that both educate and encourage others to take a chance and try something new. To learn more, visit her website - www.giamillerwrites.com. What Colors to Paint a Faux Brick Wall?